For many, the legendary “Mother Road” is the perfect embodiment of freedom and independence. Countless charming urbanizations, authentic diners and unique attractions define the character of Illinois’ Route 66 sections. Legendary – that also defines the quintessential image of Indian Motorcycle, which makes the iconic US original motorbike brand the perfect partner for our campaign “WIN YOUR DREAM”. We fitted all Indian Motorcycle retailers in Germany with attractive POS decoration packages, which are on display from October 1st thru November 30th. The microsite www.win-your-dream.de serves as the campaign’s base. An additional communication focus centres around the internationally leading motorbike fair “INTERMOT”, taking place in Cologne from October 3rd thru October 7th: Integrated into Indian Motorcycle’s booth (Hall 10.1), we provide extensive information material about Illinois and Route 66 for all interested visitors. 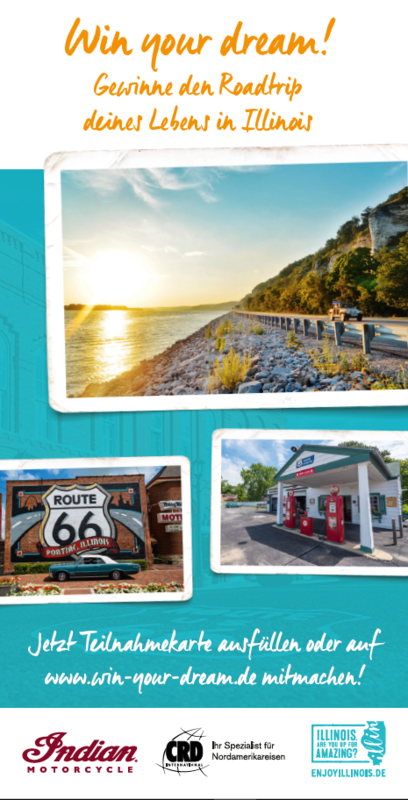 To strengthen the campaign’s awareness and costumer value, we give away a 12-day tour through Route 66’s birthplace Illinois in co-operation with CRD, Germany’s leading specialist tour operator for individual North America tours. Ready for the road-trip of your life?